Our rural property is also home to our two dogs, horses, chooks and ducks. 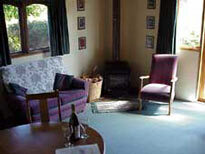 We invite you to visit us for a relaxing stay in one of our comfortable cottages, and to enjoy our wines. Wine loft 2persons self catering. The Wine Loft is up one flight of sandstone steps above the Wine Cellar. It has lovely views over the vineyard, bush and down to the water. The balcony is a good place to sit and enjoy the view and a glass of wine. The Loft has a large living/dining room and fully equipped kitchen with gas stove and microwave oven. 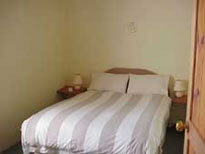 It has two queen-sized bedrooms, (a single bed is also available). The bathroom includes a shower, bath and washing machine. There is a separate toilet. The accommodation is all on the same level. This eco-designed facility is very well insulated and double-glazed for your comfort. There is both gas and wood fired heating for the cooler months. Studio cottage 3 persons with breakfast provisions. Please contact owners directly as only suitable for three under certain circumstances. This innovative solar designed cottage has peaceful water and rural views. 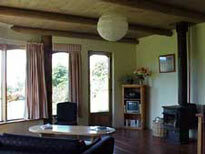 It is attractively furnished and incorporates a variety of Tasmanian timbers. The cottage is a wonderful spot for a secluded weekend and the queen-sized bed ensures a relaxing sleep. [An additional single bed is available.] A log fire supplements the solar heating. There is a well-appointed kitchen and a bathroom with a walk-in shower. 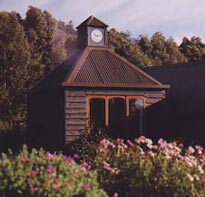 Clock tower cottage 4 persons self catering. Slightly larger than the Studio Cottage, the Clock Tower Cottage has two bedrooms with a queen-sized bed in one and twin beds in the other. It is completely self-contained with full kitchen facilities, washing machine and bathroon with a walk-in shower. While a log fire provides most of your heating needs, electric heaters in each room ensure that you’ll be comfortably warm. The sitting room offers you a sunny spot to - read a book, catch a nap or have a quiet chat over a bottle of Herons Rise Wine. Clock tower cottage self catering. Slightly larger than the Studio Cottage, the Clock Tower Cottage has two bedrooms with a queen-sized bed in one and twin beds in the other. It is completely self-contained with full kitchen facilities, washing machine and bathroom with a walk-in shower. While a log fire provides most of your heating needs, electric heaters in each room ensure that you’ll be comfortably warm. The sitting room offers you a sunny spot to - read a book, catch a nap or have a quiet chat over a bottle of Herons Rise wine. Wine loft 5 persons self catering The Wine Loft is up one flight of sandstone steps above the Wine Cellar. It has lovely views over the vineyard, bush and down to the water. The balcony is a good place to sit and enjoy the view and a glass of wine. The Loft has a large living/dining room and fully equipped kitchen with gas stove and microwave oven. It has two queen-sized bedrooms, (a single bed is also available). The bathroom includes a shower, bath and washing machine. There is a separate toilet. The accommodation is all on the same level. 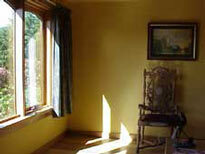 This eco-designed facility is very well insulated and double-glazed for your comfort. There is both gas and wood fired heating for the cooler months. Wine loft cottage 4 persons with breakfast provisions. The Wine Loft is up one flight of sandstone steps above the Wine Cellar. It has lovely views over the vineyard, bush and down to the water. The balcony is a good place to sit and enjoy the view and a glass of wine. The Loft has a large living/dining room and fully equipped kitchen with gas stove and microwave oven. It has two queen-sized bedrooms, (a single bed is also available). The bathroom includes a shower, bath and washing machine. There is a separate toilet. The accommodation is all on the same level. This eco-designed facility is very well insulated and double-glazed for your comfort. There is both gas and wood fired heating for the cooler months. Studio Cottage with Breakfast Provisions. This innovative solar designed cottage has peaceful water and rural views. 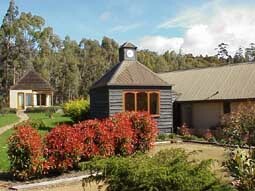 It is attractively furnished and incorporates a variety of Tasmanian timbers. The cottage is a wonderful spot for a secluded weekend and the queen-sized bed ensures a relaxing sleep. [An additional single bed is available.] A log fire supplements the solar heating. There is a well-appointed kitchen and a bathroom with a walk in shower. Wine loft 3 persons self catering The Wine Loft is up one flight of sandstone steps above the Wine Cellar. It has lovely views over the vineyard, bush and down to the water. The balcony is a good place to sit and enjoy the view and a glass of wine. 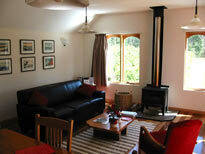 The Loft has a large living/dining room and fully equipped kitchen with gas stove and microwave oven. It has two queen-sized bedrooms, (a single bed is also available). The bathroom includes a shower, bath and washing machine. There is a separate toilet. The accommodation is all on the same level. This eco-designed facility is very well insulated and double-glazed for your comfort. There is both gas and wood fired heating for the cooler months. Wine Loft 5 persons with breakfast provisions The Wine Loft is up one flight of sandstone steps above the Wine Cellar. It has lovely views over the vineyard, bush and down to the water. The balcony is a good place to sit and enjoy the view and a glass of wine. The Loft has a large living/dining room and fully equipped kitchen with gas stove and microwave oven. It has two queen-sized bedrooms, (a single bed is also available). The bathroom includes a shower, bath and washing machine. There is a separate toilet. The accommodation is all on the same level. This eco-designed facility is very well insulated and double-glazed for your comfort. There is both gas and wood fired heating for the cooler months. Clock tower 3 persons with breakfast provisions. Slightly larger than the Studio Cottage, the Clock Tower Cottage has two bedrooms with a queen-sized bed in one and twin beds in the other. It is completely self-contained with full kitchen facilities, washing machine and a bath room with a walk in shower. While a log fire provides most of your heating needs, electric heaters in each room ensure that you’ll be comfortably warm. The sitting room offers you a sunny spot to - read a book, catch a nap or have a quiet chat over a bottle of Herons Rise wine. Clock tower 4 persons with breakfast provisions. Slightly larger than the Studio Cottage, the Clock Tower Cottage has two bedrooms with a queen-sized bed in one and twin beds in the other. It is completely self-contained with full kitchen facilities, washing machine and bathroom with a walk-in shower. While a log fire provides most of your heating needs, electric heaters in each room ensure that you’ll be comfortably warm. The sitting room offers you a sunny spot to - read a book, catch a nap or have a quiet chat over a bottle of Herons Rise wine. Clock Tower Cottage with Breakfast provisions Slightly larger than the Studio Cottage, the Clock Tower Cottage has two bedrooms with a queen-sized bed in one and twin beds in the other. It is completely self-contained with full kitchen facilities, washing machine, bathroom with a walk -in shower. While a log fire provides most of your heating needs, electric heaters in each room ensure that you’ll be comfortably warm. The sitting room offers you a sunny spot to - read a book, catch a nap or have a quiet chat over a bottle of Herons Rise wine. 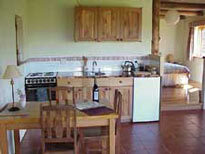 Wine loft 4 persons self catering. The Wine Loft is up one flight of sandstone steps above the Wine Cellar. It has lovely views over the vineyard, bush and down to the water. The balcony is a good place to sit and enjoy the view and a glass of wine. The Loft has a large living/dining room and fully equipped kitchen with gas stove and microwave oven. It has two queen-sized bedrooms, (a single bed is also available). The bathroom includes a shower, bath and washing machine. There is a separate toilet. The accommodation is all on the same level. This eco-designed facility is very well insulated and double-glazed for your comfort. There is both gas and wood fired heating for the cooler months. The Wine Loft with Breakfast Provisions The Wine Loft is up one flight of sandstone steps above the Wine Cellar. It has lovely views over the vineyard, bush and down to the water. The balcony is a good place to sit and enjoy the view and a glass of wine. The Loft has a large living/dining room and fully equipped kitchen with gas stove and microwave oven. It has two queen-sized bedrooms, (a single bed is also available). The bathroom includes a shower, bath and washing machine. There is a separate toilet. The accommodation is all on the same level. This eco-designed facility is very well insulated and double-glazed for your comfort. There is both gas and wood fired heating for the cooler months. Studio cottage. 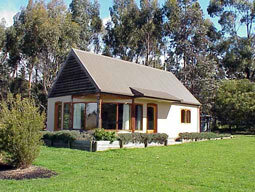 3 persons self catering. Please contact owners directly. Only suitable for three under certain circumstances. This innovative solar designed cottage has peaceful water and rural views. 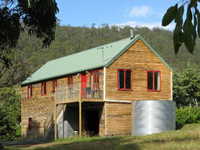 It is attractively furnished and incorporates a variety of Tasmanian timbers. The cottage is a wonderful spot for a secluded weekend and the queen-sized bed ensures a relaxing sleep. [An additional single bed is available.] A log fire supplements the solar heating. There is a well-appointed kitchen and a bathroom with a walk-in shower. Studio cottage. Self catering. This innovative solar designed cottage has peaceful water and rural views. 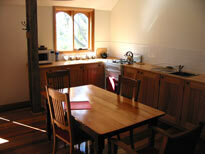 It is attractively furnished and incorporates a variety of Tasmanian timbers. 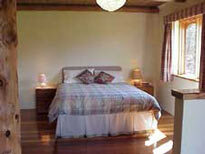 The cottage is a wonderful spot for a secluded weekend and the queen-sized bed ensures a relaxing sleep. [An additional single bed is available.] A log fire supplements the solar heating. There is a well-appointed kitchen and a bathroom with a walk in shower.